Stocks across the board set record highs on Monday, as Wall Street preps for passage of a U.S. tax reform bill. Stocks across the board set record highs on Monday, Dec. 18, as Wall Street prepped for passage of a U.S. tax reform bill that is expected to boost corporate profits and increase share buybacks. The Dow gained 192 points or 0.8% on Monday, the S&P 500 rose 0.7%, and the Nasdaq jumped 0.8% as investors anticipated a vote on Capitol Hill this week that could put the proposed $1.5 trillion tax cut into law by the end of the year. The Dow - at 24,844-- has risen more than 5,000 points in 2017. American Express Co. (AXP - Get Report) and Intel Corp. (INTC - Get Report) were the leading gainers on the blue-chip index. European markets also were seeing strong gains. In Asia, the Nikkei 225 in Japan rose 1.55% and the region-wide MSCI ex-Japan index gained 0.42% despite weakness in China markets owning to another push to curb speculation by the country's regulators. Global oil prices edged higher again Monday as traders continued to factor in both the shutdown of the Forties North Sea pipeline system and a surprise reduction in the number of U.S drilling installations, which fell for the first time in six weeks last week. Brent futures for February delivery rose 0.6% to $63.59 a barrel while West Texas Intermediate crude gained 0.9% to $57.88. 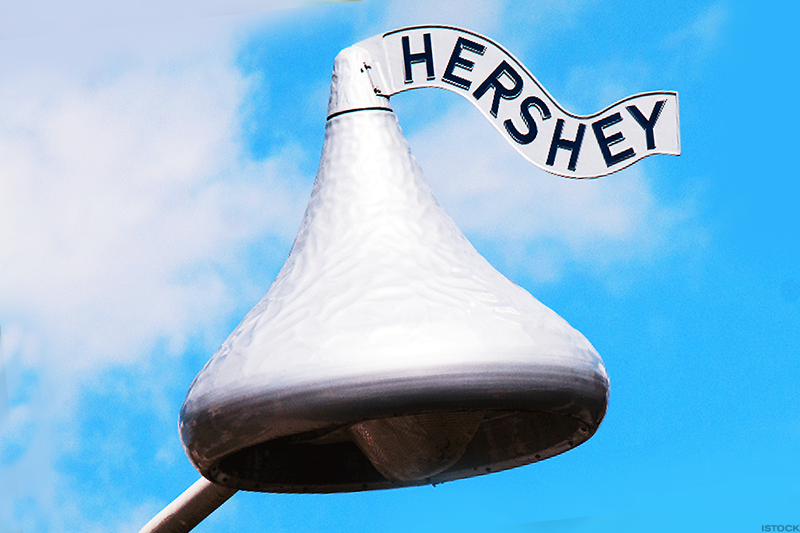 Hershey Co. (HSY - Get Report) reached a deal to acquire Amplify Snack Brands Inc. (BETR , the maker of SkinnyPop, for $12 a share, or a total of $1.6 billion including debt. The price of $12 a share values Amplify at a 71% premium to its closing price of $7 on Friday, Dec. 15. Amplify jumped more than 70% in trading early Monday to $11.94. CSX Corp. (CSX - Get Report) shares were flat on Monday following the sudden death of CEO Hunter Harrison and questions over the fate of the freight company's multi-billion turnaround strategy. Harrison, 73, had taken a medical leave of absence from the company last week but died Saturday "due to unexpectedly severe complications from a recent illness," the company said in a statement. "Calling Harrison a "larger-than-life" figure, CSX Chairman Edward Kelly vowed to "continue to consider in a deliberative way how best to maximize CSX's performance over the long term." Twitter Inc. (TWTR - Get Report) shares gained 7.5% to $23.92 as the social media group begins to enforce rules that will crack down on extremist content and possibly smooth the path for renewed takeover interest in the microblogging platform. The stock also appeared to be a getting a bump from a Monday upgrade by JPMorgan Chase, which raised its price target on the company to $27 from $20 and shifted it recommendation to "overweight." Snyder's-Lance Inc. (LNCE jumped 6.5% on Monday to $49.81 after Campbell Soup Co. (CPB - Get Report) reached a deal to buy the pretzel and chips maker for $50 a share, or $4.87 billion. Shares of Activision Blizzard Inc. (ATVI - Get Report) rose 0.06% after the stock was initiated with a buy rating at BTIG. Bitcoin prices began to converge slowly on Monday as the launch of a second futures contract linked to the cryptocurrency looks to have smoothed some of the gaps around global trading benchmarks as regulators set their sights on the $500 billion market. The CME Group's debut of its 5-to-1 bitcoin futures contract, which is linked to a reference rate taken from a range of cryptocurrency exchanges, appears to have brought some level of convergence to the market, with its front-month product trading at $18,900 against a $18,870 price quoted for the similar week-old contact trading on the Cboe. Spot bitcoin prices, which denote immediate purchases of the digital currency, were quoted at around $18,687 on the bitstamp trading platform, one of the main exchanges that feeds prices into the CME Group's calculation of its futures contract. In economic news on Monday, the National Association of Home Builders' monthly sentiment index rose 5 points to 74 in December, the highest reading since 1999.